Surrounded by mature specimen trees the picturesque Roger’s Rose Garden is on undulating land beside the mighty Waikato River. 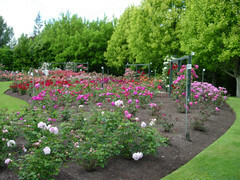 The garden contains large informal beds of Hybrid Teas and Floribunda planted for mass colour, complemented by large lawn areas and single specimen trees with a backdrop of climbing roses displayed on frames, weeping roses on hoops and procumbent roses in a bed near the entrance to the garden. 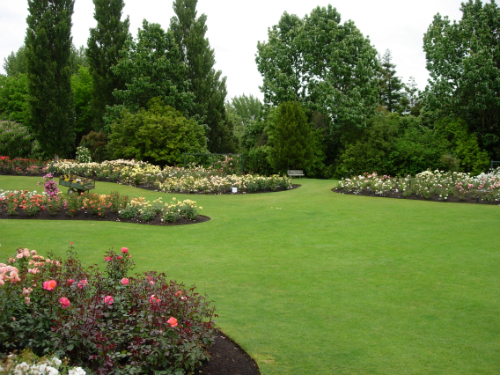 The impact when all the roses are in bloom is stunning. 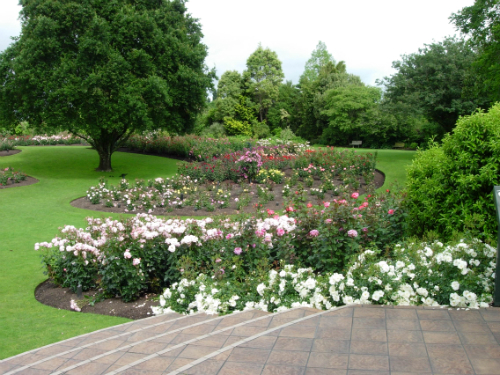 As a point of difference, the formal French Rose Garden with its white pergola covered in rambling roses, rose beds surrounded by box hedging, white “French style’ bench seats and tile paved stairway is sited overlooking the main rose garden. 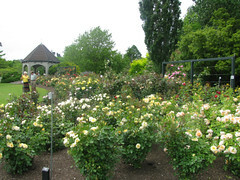 It is a traditional species rose garden with beds representing species from Persia, China, the Ancient world and North America. Three walks off it focus on three famous French rose breeders: Jean Baptiste Guillot, Francis Meilland and Empress Josephine. The Waikato Rose Society make use of the Roger’s Rose garden for their cultural talks and to view the trial roses and watch their growth habits, health and general performance. Public pruning demonstrations are held in winter. In November the Pacific Rose Bowl Festival is held in the Roger’s Rose Garden to coincide with other garden shows, this festival is based around an internationally recognised rose trial to determine the “New Zealand Rose of the Year”. 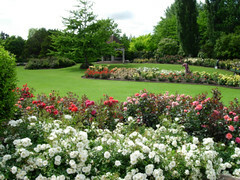 This is complemented by the Waikato Rose Society’s Annual Spring Rose Show in the nearby Hamilton Gardens Pavilion where outstanding rose blooms are on display. Bushes of the best roses from around the world are entered to contest the Pacific Rose Bowl Trophy. This event lasts a week, judging is by popular vote of the general public. School groups get involved for the “Children’s Choice Award”. The Rogers Rose Garden recieved the World Federation of Rose Societies Garden of Excellence award in 2006. As far as I know, this rose has not made it to New Zealand so unfortunitely, I cannot help find somewhere to buy it. My mother is looking for a rose named “The World” as a gift for her friend. Does anyone know where I might find this rose plant as I’ve had trouble finding one. 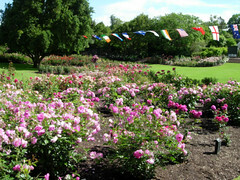 Thankyou, yes, South pacific Roses has “The world” . We had been ringing around the garden shops with no joy, so, thank you!